Slow wire cutting is a type of wire cutting. The electrode is subjected to pulse spark discharge to remove metal and cut by using a continuously moving fine metal wire (referred to as a wire) as an electrode. 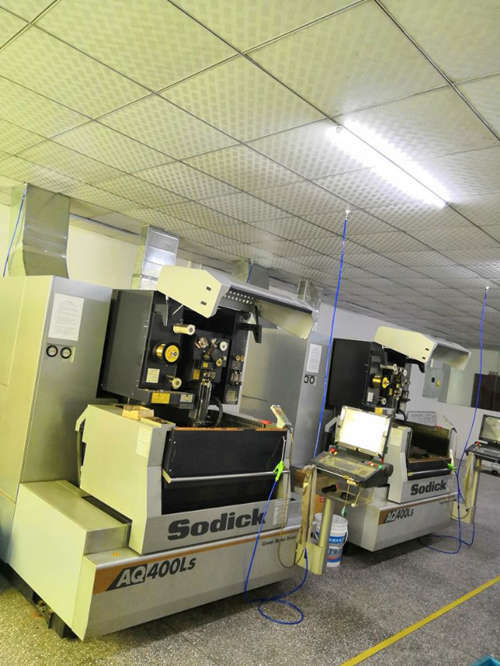 It is mainly used to machine a variety of complex and precise workpieces. High-precision and stable machining can be achieved by using a unique wire-drawing servo. In addition, a high wiring rate is achieved by assembling a high-speed automatic wiring device with a straightness function. The operating time is reduced by the ratio and a long time high speed unmanned operation can be realized. Since the liquid feeding and discharging time of the working fluid is greatly shortened, the work efficiency is improved. In addition, by arranging the operating devices centrally around the control panel, the burden of daily work is greatly reduced. In terms of maintainability, the construction in which the filter box is placed in front is convenient for the operator to operate, thereby contributing to the improvement of production efficiency. 3. The XYUV axis is equipped with a linear servo motor developed by the company. The linear servo motor is mounted on the world's leading EDM machine. Compared with the conventional ball screw drive mechanism, it achieves high responsiveness and positioning accuracy. In addition, since there is no distortion and no wear, long-term stable high precision is ensured. 4. The high-speed, high-precision, high-stability processing of the practical processing machine with the easy-to-operate slidable machining slot door, and the space meter of the machine body main power supply auxiliary tank integrated structure, won the praise of customers, become the electric discharge machine The best selling model in the middle.